When a person has an accident, such as a fall while sleeping, and there are no injuries, the encounter following an accident and its external causes need to be reported. Have you ever been injured while sleeping? I have been pondering that question. I’ve never slept out in the wilderness and had a black bear attack me. I can’t recall a time when I fell out of bed or got up from bed and walked into a lamp. Then it dawned on me that we all probably have slept in the wrong position at one time or another and woke up with pain in the back or neck. And the thought of sleeping on a tree branch for very long could definitely cause me back pain. After further reflection, I recall a time when my son, only about 9 months old at the time, fell off a sofa and hurt himself. Can you imagine the concern if it were your child? It scared me, and I worried that he could have broken his nose or suffered a concussion. Thankfully, though, he was fine. A 9-month old child rolled off the sofa and onto the floor while sleeping at a relative’s home. The mom stated she was sitting next to her child on the sofa, and while she was looking away, the incident occurred. The mom was very concerned about possible injury. Pediatrician examined the child for any outward signs of injury or sustained trauma. The encounter was for observation, and suspected injury after fall was ruled out. The mom was instructed to look for any signs that may develop. First of all, the patient presented to the pediatrician’s office after having an accident (fall), but no symptoms or injuries were documented or diagnosed. In outpatient reporting, if the patient displays no signs or symptoms, we must report a code from categories, Z03, Z04, or Z05 to show observation for suspected conditions, according to ICD-10-CM Official Guidelines for Coding and Reporting. These codes are used when a patient is seen because the parent thinks the child has a condition, but after careful review, the condition does not exist. 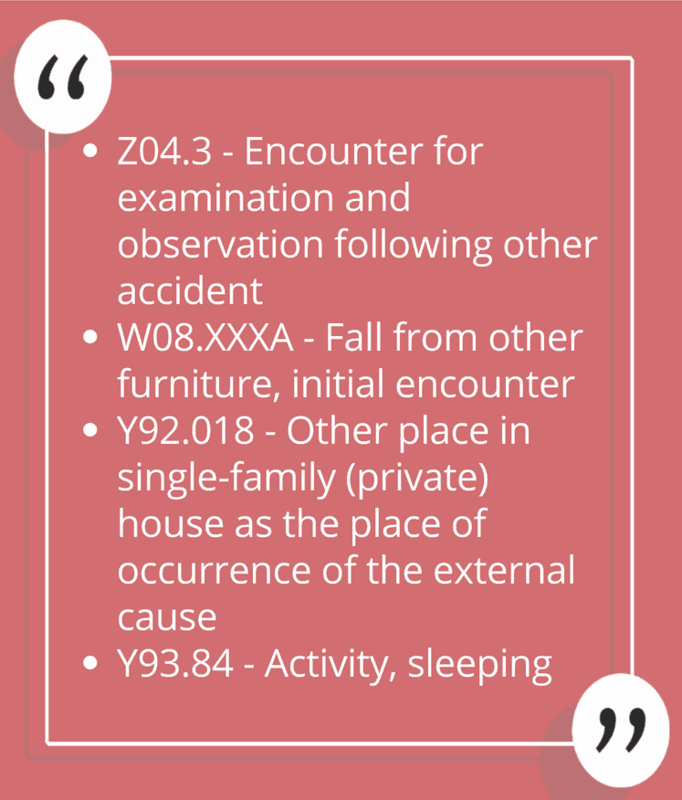 Z04.3 – Encounter for examination and observation following other accident. We can also assign the external cause codes based on the documentation. Chapter 20 codes (External Causes of Morbidity), include categories V00-Y99. These codes are secondary codes used to identify the cause, intent, place where the patient was when injured, patient’s status, and activity being performed at the time. These codes are never reported alone. The child fell from a sofa while visiting a relative’s home, and the activity was sleeping. External cause: W08.XXXA – Fall from other furniture, initial encounter. The 7th character “A” indicates that patient is receiving active treatment. Hopefully, you have learned a few things here. When a patient presents for a suspicious condition after an accident, but there are no signs and symptoms and no diagnosis, we need to code for the encounter following the accident. We also need to assign the external cause codes based on the documentation. And hopefully, you will take my advice and get your child checked out after a fall like this just to be on the safe side.